I was randomly invited to go see San Diego indie-rock band Pinback last night at Headliners and was pleasantly surprised by the diverse style of bassist Zach Smith. He drove the rhythm and energy of the band by hammering out bass lines similar to pounding out power chords on a guitar. 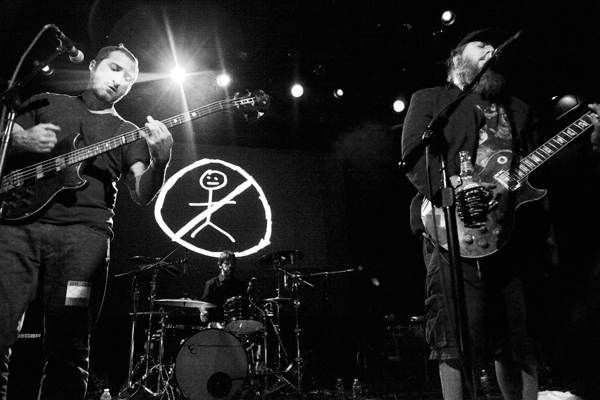 The picking and palm-muting of lead guitarist/vocalist Rob Crow added to the melodic, space-rock rhythm of Pinback. The harmonies sung by Smith and Crow were perfectly in unision during most of the choruses, creating a pitch-perfect offset. Their background video projections included eloquent black-and-white films such as Night of the Living Dead; fantasy sequences of space travel set before modern technology’s advancements and story book stick figure animation done by Crow. 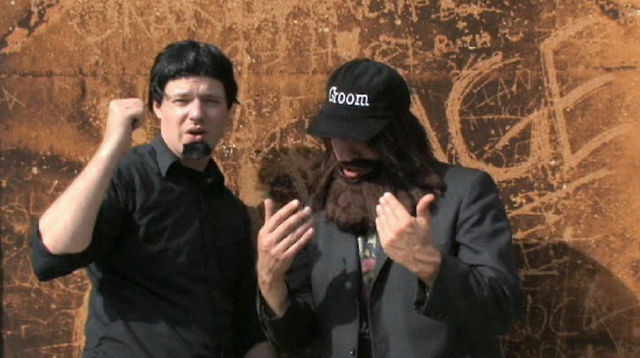 They also used a video parodying nu metal rock bands such as Korn and Limp Bizkit for the song “Good to Sea.” This video had Smith and Crow dressed in all black, with their pointy, nu metal facial hair and cargo pants. Their heavily animated movements had Smith mechanically swaying back and forth, slapping a three-stringed bass while Crow swivels his head side-to-side frantically, with a terrified System of a Down look in his eyes. They played for nearly two hours and came back with several songs for their encore. I like being able to go to any show at Headliners or Zanzibar, knowing that I will most likely see a good band. I think this bodes well for Louisville’s music scene. I am also excited to see Frightened Rabbit, Grizzly Bear, Jim James, Houndmouth, Local Natives and many other bands I’m probably forgetting. Party on Wayne!